My next-door neighbor has two Knock Out Roses in her front yard. These are the roses that you see everywhere these days: in every suburban yard, in every landscaped island in the shopping mall parking lot, even in front of the windows at every Denny’s restaurant. If they can keep them alive at Denny’s, they must be indestructible. In fact, Knock Out Roses were designed to be indestructible. They are relatively new on the market, only appearing in the last 10 or 15 years. They are supposed to be the perfect rose: they will grow in any climate, they will resist any disease, and they will overcome any obstacle to spectacular, long-lasting, vibrant rosiness. Jackson & Perkins advertises them like most dealers: “Easy to grow, long-blooming, winter hardy and heat tolerant, and perfect for any landscape, … Knock Outs® don’t require special care, they’re self-cleaning, have stunning flower power, and are the most disease resistant roses on the market.” Any time an advertising copy writer can use the phrase, “stunning flower power,” you know something significant has been developed. The key here is that passive construct, “has been developed.” To bring such almost-mystical perfection to suburban gardens and parking lots, someone took a common rose bush and engineered it to within an inch of its life. Notice that when the Jackson & Perkins copy writer mentions the Knock Out variety, there must be a copyright symbol appended to its name. These roses are nature manipulated to such a degree that all rights to divide it, to root a cutting from it, to graft it, to name it, or even to sell it must be granted by the patent holder. The message is clear: this rose will never belong to you. You may place it in the soil in which you garden, and you may trim it and water it and fertilize it, but its ownership will forever belong solely to the genetic engineering firm which deigned to grant you those very limited rights. Frankly, I am a bit nervous writing about these marvels of engineering. I am afraid that I will have attorneys swarming my home tomorrow morning because I can’t figure out how to get my keyboard to cram a little R into a circle after each time I use the name Knock Out. I have to admit, though, that for all of their ubiquity and carefully patented design, they really are pretty. The colors of red, pink, and fuchsia are brilliant, and even the yellow ones, which the engineers introduced to the market in the past 5 years or so, are coming along in their vibrancy. As a flower, I am not disappointed that my neighbor has some Knock Out Roses where I can see them. My disappointment is where they are located in her yard. They are planted right on our shared property line, about three feet back from the curb. On my side of the property line in the same place is my perennial bed. That is where I planted my variegated lantana, the “cemetery lily” a friend gave us, and some cannas which have filled out some empty spaces nicely. That bed is the only place I have anything like an Asiatic lily, since it is open and breezy out there and the pollen is less likely to activate my wife’s allergies. It is where calla lilies and gerbera daisies have come back two springs in a row now and the tropical hibiscus flare all summer. It is where I have our beloved black-eyed susans, which remind us of the flowers my wife carried in our wedding. I built the bed around our mailbox in the only space of full sun that makes sense for a perennial bed in my yard, and overall, I have been happy with the results. But the neighbor’s Knock Outs crowd too close. The cemetery lily has to compete for sunlight. 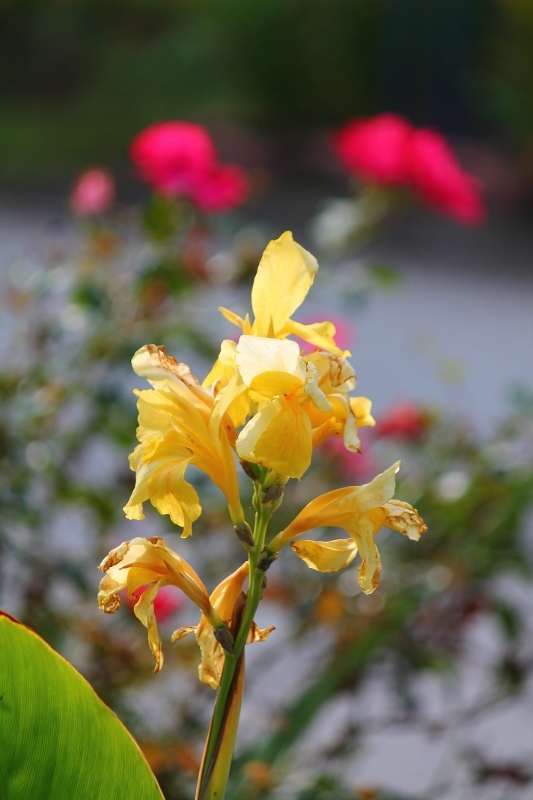 The cannas have to force their way through the branches of the Knock Outs before they bloom in their yellow torches. The neighbor doesn’t choose to remove the bermuda grass from under her roses, so weeds and grass spread from her yard into my flower bed. And did I mention that the engineers who developed the Knock Outs did not think it wise to remove the genes that produce the thorns? Those things are as wicked as any wild rose, so trimming and weeding around them require some gyrations which the guy across the street who lurks in his garage all day undoubtedly finds amusing. Other than some passive-aggressive trimming here and there, I have not been sure what to do about the Knock Outs which so garishly cross the boundaries of suburban civility and invade my prime perennial real estate. Really, the conflict for sunlight and air space is not my neighbor’s fault. Her husband planted them as small, spindly shrubs about five or six years ago. At that time, there was a wooden, split-rail fence which ran the length of our shared property line, and there was only grass in that part of my yard. I remember the day they planted them, although it seemed insignificant at the time. My neighbor and her husband were always working in the yard together, and even through the mundane tasks of mowing and weeding and planting and pulling, it was so clear that they had a long-lasting and beautiful relationship. She placed the pots from the nursery where she thought they should go; he shared his own thoughts. She nagged him a bit, and then he dutifully dug the holes. Together, they planted them. The new shrubs were already flush against the fence, but at the time, that made sense; their growth could intermingle with the fence rails to add some color and texture to an otherwise unremarkable part of their yard. If I remember right, it was only a few months after they planted the Knock Out Roses together that my neighbor’s husband stopped my wife and me in our driveway one day. He wanted to tell us that he had been diagnosed with cancer. Was it lung cancer or liver cancer? Or maybe leukemia? I don’t remember, and it really doesn’t matter now. He had surgery, and I visited with him briefly when he was in the rehab unit at the same time as a member of my congregation. He went through other treatments; we would inquire about how he was doing when it seemed appropriate. Like so many people in their situation, they tried hard to stay positive, so we never really knew whether their optimism was based in what the doctors were telling them or in what they wanted to believe. Probably the truth was somewhere in between, but again, that doesn’t really matter now. I don’t know if it was from our neighbor or from the nice couple across the street that we first heard he had gone under the care of Hospice. But a few weeks later, the woman from across the street knocked on our door late one evening to tearfully tell us that she heard he passed away. Together, we went to the house of the guy who lurks in his garage all day because we knew he would want to hear the news before it came out in the paper. This winter, I realized it was time to do a major overhaul of my perennial bed. Besides the usual spring cleanup, the space needed to be expanded and some plants needed to be divided and moved. Last week, I moved the cemetery lily and the cannas away from the property line so they wouldn’t compete so much with my neighbor’s Knock Out Roses. I reached my hand rake under the Knock Outs to scratch away the grass that was still trying to invade my flower bed, and I spread a generous layer of mulch to keep the grass and weeds at bay for a while. I am making my peace with my neighbor’s Knock Outs, recognizing that, if I design things right, they could be less of an encroaching competitor and more of a vibrant and pleasing backdrop for the mix-up of cannas and lilies and hibiscus and lantana and black-eyed susans I am trying hard to nurture.